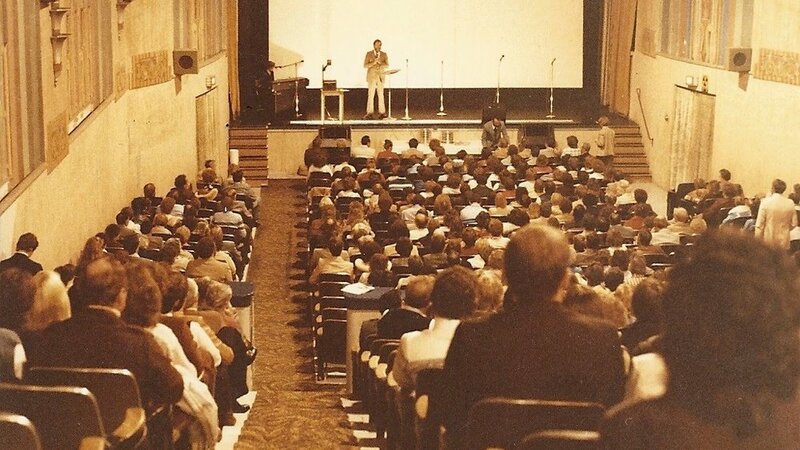 FORMER PASTOR GENE ARNOLD PREACHING AT THE GRAND ISLAND 'GRAND THEATRE', THE YEAR WAS 1978. The church now known as Abundant Life Christian Center was born in a dance hall in October, 1927. Soon after the meetings in the old Cherry Street Dance Hall the fledgling congregation rented a store-front building on Fourth Street and soon the new Assemblies of God church took form, soon outgrowing the store-front. In 1930 the former home of Trinity Methodist Church at the corner of Sixth & Sycamore Streets became available when their congregation occupied its newly constructed building at a different location. The new Assembly of God congregation purchased it. Throughout the very difficult years of the Great Depression of the 1930s the congregation continued to slowly grow. Soon after the 1950s arrived it became obvious that a new building at a new site was needed. Soon after a new pastor was elected in 1955 a new building project began at the corner of Fifteenth & Eddy Streets. The people of the congregation furnished nearly all the labor and in 1957 the new brick building was occupied. At the close of the 1960s the church was thrust into a surprising period of renewal and refreshing in the Holy Spirit. The Charismatic Movement had come to Grand Island and, although many denominations and individual congregations resisted this fresh revival, our congregation embraced it and the pastor became an influential leader across denominational lines. By the mid-1970s the congregation and its leaders was made up of people from many different church traditions and the leadership declared it to be, “A Trans-denominational Church.” In the fall of 1976 the people voted to re-name the church, “Abundant Life Christian Center.” Beginning in 1973 the church began to add additional ministry staff to serve along with its lead pastor, and in 1976 multiple Sunday services were begun in order to accommodate the growing numbers of people. By April, 1977 the difficulty created by the outgrown building with its limited parking became too much to deal with and a search began for an alternative. 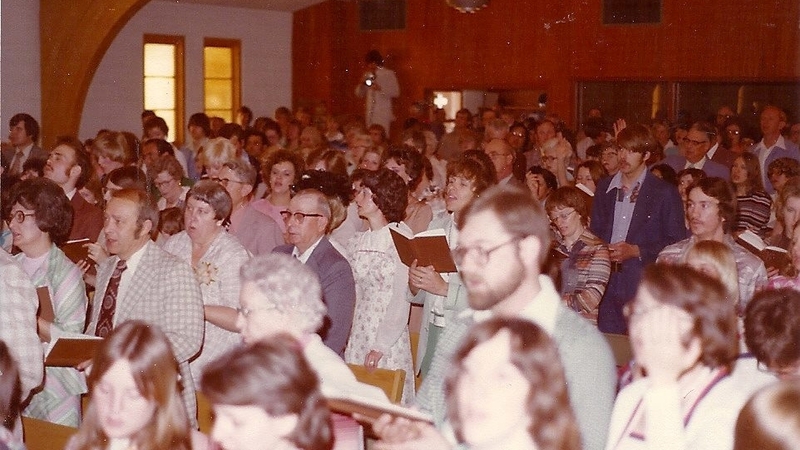 In May, 1977 ALCC began conducting its Sunday Morning services in the auditorium of Grand Island Senior High. This site was not always available so on those Sundays the meetings were held in one of four schools or two theaters. Due to the devastating tornado of June 3, 1980, from June, 1980 until November, 1981 the Sunday morning services were conducted at the Grand Theater in downtown Grand Island. In 1978 an acreage at the west edge of the city became available and was purchased through a ten-year land contract with the owners. Although the years of 1978 through 1983 were marked by some of the most difficult financial crises ever seen in the region, by the grace of God a new building was constructed in 1981 with the first service in the new building being held on Sunday, November 8, 1981. Construction began the following day on an addition and by early 1987 all four of the building projects that created the current campus were completed and in full use. The years have been a glorious mix of pain and joy, of tears and laughter. Through all of these our God has proven He is a faithful God! Abundant Life Christian Center is now in a new season of its life. Sometimes obedience to the voice of the Holy Spirit requires tough decisions. One of these painful decisions is shown by an event recorded in Acts 15:37-41. A disagreement arose between Paul and Barnabas that was so strong it separated them from ministry together. In December, 2015, such a disagreement resulted in the membership of Abundant Life Christian Center casting their votes to separate from the denomination. Abundant Life Christian Center is now an independent, non-denominational church. It remains faithful to its heritage and ever mindful that the body of Christ in the earth today is greater than any single church, fellowship, or denomination. So long as our Lord leaves His Church on earth, Abundant Life Christian Center will do all in its power to faithfully execute the mission God has tasked us with. WE WILL BE PEOPLE OF HIS PRESENCE! Of the nine lead pastors who have servedAbundant Life Christian Center, three are still living and actively involved in church life. Gene Arnold served from 1966 until 1990, returned to Grand Island in 2011 and is an elder. Steve Warriner served from 1990 until 2015 and now travels from Grand Island in an apostolic ministry throughout the U.S. and abroad. Jason Warriner is the lead pastor. Reared in the church from age six, after high school he spent several years in Mexico where he was discipled and began ministry. Upon returning to Grand Island he served Abundant Life Christian Center as its youth pastor for about ten years and was chosen to be the lead pastor in 2015.